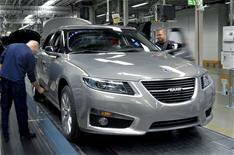 Saab delays production restart | What Car? Saab has delayed restarting production until August 9, because of a shortage of parts. The car maker had said it would restart work at its Trollhattan factory within two weeks, after securing funding to pay suppliers and employees. Saab says this latest delay has been caused by some of its suppliers needing longer to produce enough parts. Production has been at a halt for a large part of the previous three months, but Saab has secured short-term funding from various sources, along with an order for 582 vehicles worth 13m (around 11.5m) from an unnamed Chinese company. Saab has also been given the go-ahead to sell property that was previously used as collateral for a state-backed loan from the European Investment bank. The sale will bring in around 25m.